Laura Johnson: Happy Birthday To Me . . .
. . . from the depths of the sea! Yesterday was my birthday and we went to the beach, even having a picnic in the car because it was raining, just like when I was a child! It did brighten up though and we had a marvellous time foraging for sea glass. For the first time I found a full bottle neck and excitedly wore it all afternoon as a ring! Thank you to everyone who sent me greetings and gifts; I have been thoroughly spoilt and thoroughly enjoyed it! Happy Birthday to you! Hope I remembered to write that on the postcard I sent you! Glad you had a good day. I've just been catching up with you - you've made some stunning pieces, despite the frustrating bits. 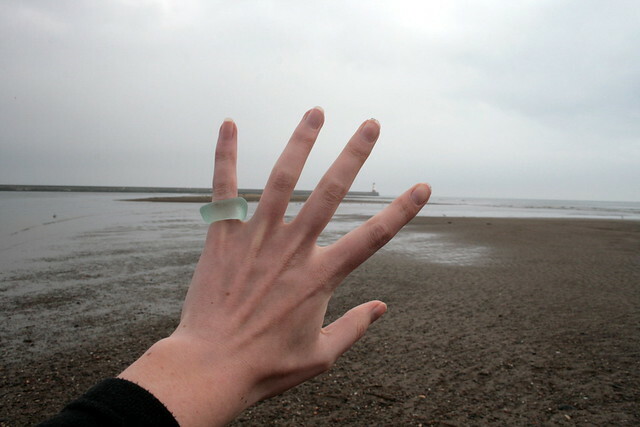 Your 'ring' is beautiful! I noticed in your book reviews you mentioned Remarkable Creatures, by Tracy Chevalier. I'm in the middle & find it quite facinating. I think it neads a certain approach - having said that maybe I'll try an open mind with Margaret A!